Local artsits of all kinds joining together to create change. A silent auction for donated artworks will begin at 6:00pm and go until 10:00pm. 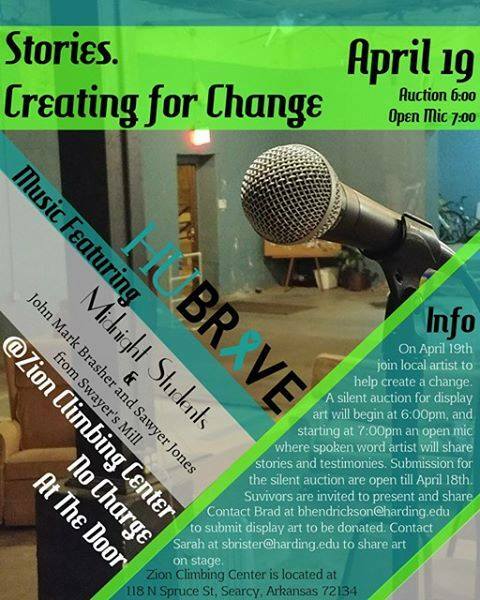 Starting at 7:00pm, survivors will take the stage with spoken word, art, music, and other forms of expression. Survivors and friends alike are welcome to attend and present. If you would like to donate paintings, drawings, sculptures, and other tangible artwork, please contact Brad Hendrickson at bhendrickson@harding.edu. Art needs to be submitted by April 18. If you are interested in expressing through open mic, please contact Sarah Brister at sbrister@harding.edu or sign up the day-of by 6:30pm. This is free to attend, though donations are certainly welcome. All proceeds from sold artwork will benefit HUbrave.